Expressadz.in historical owner info, name servers, Analytics ID, Adsense ID, Addthis ID, advertisers, screenshots, meta tags, whois, site and server info. 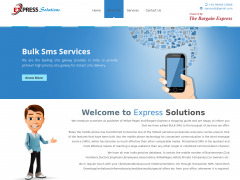 We introduce ourselves as publisher of Yellow Pages and Bargain Express-a shopping guide and are happy to inform you that we have added BULK SMS to the bouquet of services we offer. Sites related to Expressadz.in based on metadata.